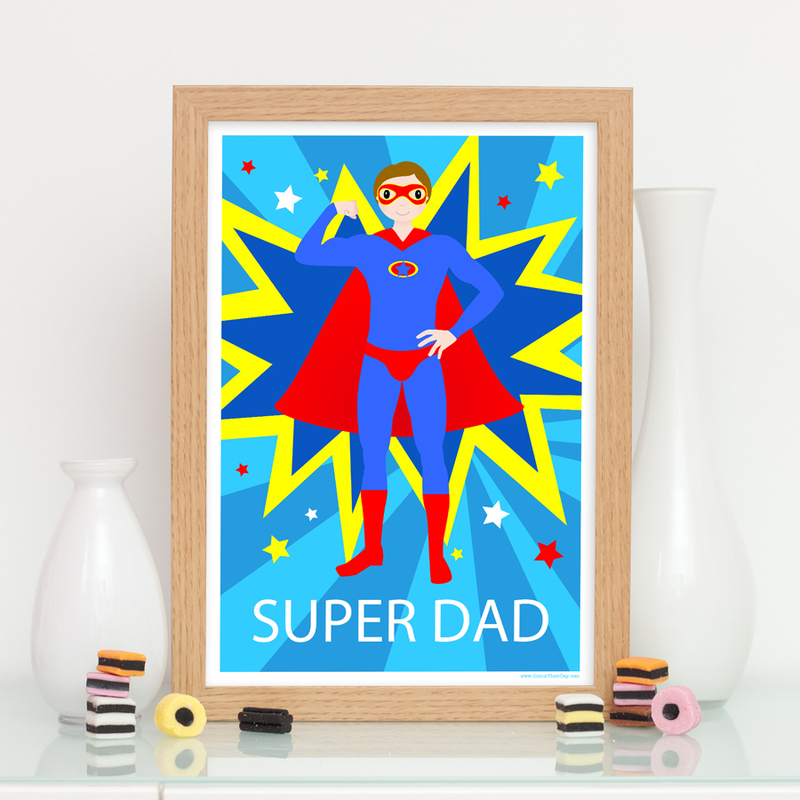 This Super Dad Superhero print will make a fantastic gift for your Dad, who may perform like a superhero everyday! Let him know just how super he is with this colourful and original print. Change the name ‘Dad’ to any name you would like and the print is perfect for anyone. The design features a male superhero, complete with cape and mask, exploding out of a dynamic blue and yellow background. The text ‘Super Dad’ is printed along the bottom. The print is available in 7×5 inch unframed, 7×5 inch framed, A4 unframed, A4 framed and A3 unframed. The A4 and A3 size can be personalised by replacing ‘Dad’ with any name you would like; Daddy, Granda, a first name or you can choose your own alternative phrase like the example shown, ‘Be Super’ (see photos). Please select which you would like and fill in the relevant details. You can also choose to personalise the character on the A4 and A3 print by changing her skin and hair colour. Please take a look at the example images to see the different options available. If you do not want to personalise the character your print will have the brunette superwoman. Any questions, just contact me. Enter the name or short phrase you would like on this print. Enter the skin colour and hair colour you would like on the character. Please choose from the three skin colours in the examples; white, dark and black. Please choose from the following hair colours; black, brunette, blonde, red or grey. 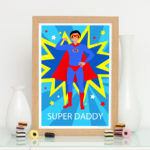 Be the first to review “Super Dad Superhero Print” Click here to cancel reply.